A suspense-thriller about a nightmare scenario-a countdown to a Mumbai-style attack on U.S. soil, where the FBI, the Israeli Mossad, the US-based Iranian clandestine terror network, and the Islamic Jihad fraternity, all engaged in a timeless conflict, which plays out to a crescendo that comes to a head before the dramatic conclusion. The story offers an ample dose of realism, a cast of intense characters who engage in love, lust, and violence. 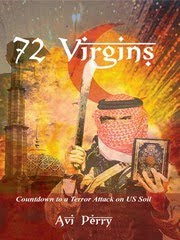 It portrays the Jihad culture with its rationale and the volcano that breeds an irrational obsession with death. Moreover, it builds on the Jihadists’ motivation for targeting so many innocents and exploiting the victims’ massacre as a stepping-stone to their dream of eternal paradise next to Allah’s throne. The real question is not whether Jihad terrorists’ plots will ever cease to emerge-there is no chance of that. The question the book seeks to answer is, will the next one be stopped before it’s too late? This was the first book of its kind that I have read and it was a real eye opener. I found it to be extremely realistic and I found the Jihad mindset to be really shocking. I knew somewhat of the beliefs prior to this book, but now have a better understanding of how they justify their actions. Its pretty scary actually! The book has interesting characters that made it a worthwhile read and I wanted to learn more about each of them. The story was written in third person from a variety of character’s viewpoints so that I could get a good idea of what each one was dealing with and thinking. I would have liked to connect more with them, but overall I think the author did a great job in making believable characters. The story is fast-paced and exciting and reminded me of an action movie. There is always something going on so it keeps the interest level high. I wanted to keep reading to find out how it would all play out. I could see this becoming a movie actually! The only criticism I really have is that I found the ending to be a bit rushed. I wished the author would have drawn it out a bit more. It just seemed like it was over kind of fast. Overall, this is a great book and I recommend it if you love to read thrillers.